Civic is a responsive multipurpose Magento theme which is fully customizable and suitable for any kind of Magento store on any device. This responsive theme is a general purpose responsive theme which can be highly customized and tailored for any heavy Magento store. 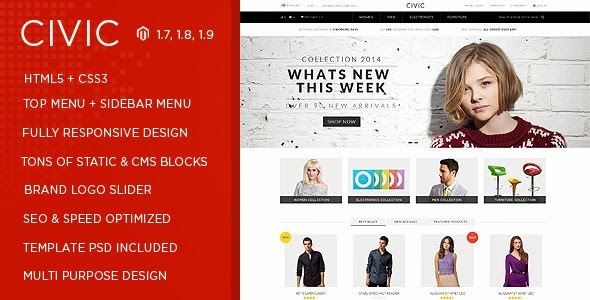 Civic Magento theme can be customized as full width or fixed width layout. This Magento theme has a instant color configuration that you can use to change the color of your theme. You can quickly create the Featured and Bestsellers lists that attract and engage your visitors and drive transactions. Item Reviewed: Civic Responsive Multipurpose Magento Theme 9 out of 10 based on 10 ratings. 9 user reviews.